President Trump’s team has already relayed to Congress that a potential deal with North Korea will be subject to congressional approval. If an agreement does not rise to the level of a treaty, it could go down the path of the Iran deal, which was an executive agreement. Lawmakers want any agreement to hit multiple points, like denuclearization and tackling North Korea’s human-rights abuses. 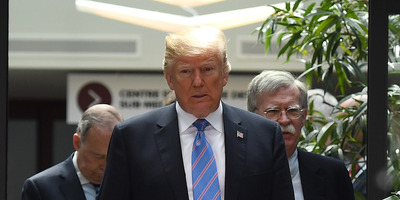 WASHINGTON – Lawmakers want President Donald Trump to come home from the historic summit with North Korean ruler Kim Jong Un in Singapore with enough diplomatic progress that will ultimately lead to an official treaty ready for the Senate to ratify with a two-thirds majority vote. But the prospect might be too difficult, and Senate Republicans do not want a half-hearted agreement that can be scrapped by a different administration, à la the Iran deal. Administration officials have already relayed to senators that they intend to submit any plan to the Senate for approval. But the Senate is split and highly polarised in its current form, which could prove to be tricky when trying to usher through a landmark agreement. In the event a deal is reached, its different elements would require different means of approval. Easing sanctions would require an act of Congress, ending the Korean War in a peace deal would rise to the level of a treaty. The complexities and binding nature of a deal has many senators on the fence about what would be acceptable. “Since all the Republicans insisted that President Obama bring it here – and I agreed with them – at a minimum President Trump has to do that,” added Kaine, who sits on the Senate Foreign Relations Committee. Sen. John Thune, the third ranking Republican in the Senate, told Business Insider that an executive agreement like the Joint Comprehensive Plan of Action could hamper any deal’s longevity. “I would hope they want to take a different tactic than they did with the Iran deal and actually have Congress’ approval because I think it makes it more durable and more lasting,” Thune said. Other Republicans on the Foreign Relations committee, like Sens. Rob Portman of Ohio and Wisconsin’s Ron Johnson agreed, that a ratified, concrete treaty is ideal. But that is an uphill battle, as many lawmakers in both parties would not tolerate a lighter deal that does not hit every point on North Korea, which has been a highly unpredictable and dangerous actor for decades. A sticking point for some are North Korea’s long track record of human-rights abuses and brutalization of Americans, most recently college student Otto Warmbier, who died shortly after returning to the US as a result of injuries sustained while he was in captivity. Sen. Chris Murphy, a Democrat on the Foreign Relations committee, told Business Insider that he is “not prejudging whether it has to be ratified” because any final details would have to hit the mark in multiple areas. “I’m just petrified that the president is going to get his clock cleaned by Kim because he refuses to do the study necessary to understand the complicated balance of trade-offs that may be offered by North Koreans,” Murphy added.